Sold as a Baker's Dozen - Buy 12 and Get 1 Free! OM-CP-TRANSITEMP-EC Series are in the end of its life cycle. As a possible substitute/upgrade, please check out Newest Released One Time Use PDF Logger OM-21A Series for more advanced features with better price. The OM-CP-TRANSITEMP-EC is a low-cost temperature recorder designed to allow the user to easily monitor temperature fluctuations over time during shipment or storage of goods. Each logger can only be started once to monitor temperature during one application (single use). Used data loggers can either be discarded or returned to be refurbished to like new condition so they can be used again. The refurbish charge is $15 for each logger. This all-in-one, compact, portable, easy-to-use device will measure and record up to 8191 measurements per channel. The storage medium is non-volatile solid state memory, providing maximum data security even if the battery becomes discharged. The device can be started by holding down a recessed push button. Once started, a green LED indicator light will blink twice to indicate that the device is active. A second red LED indicator will blink at 3-second intervals if the temperature goes above or below the selected alarm settings. The OM-CP-TRANSITEMP-EC makes data retrieval quick and easy. Simply plug it in to an availalbe COM port and our user-friendly software will do the rest. The software converts your PC into a real-time strip chart recorder. Data can be printed in graphical or tabular format and exported to a text or Microsoft Excel file. 참고: Operator’s manual and RS-232 cable are included with the OM-CP-IFC103 Windows software (required to operate the data logger and sold separately). 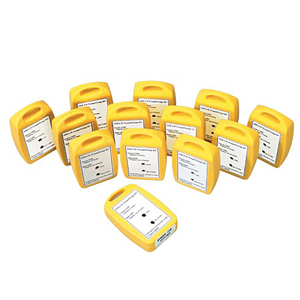 Used data loggers can be returned and refurbished to like-new condition for $15 each. Contact our Customer Service Department for details.